Hello! I know I said this was going to be up yesterday, but Blogger was playing up and wouldn’t let me upload pictures, so apologies for the delay! Anyway, I wanted to talk to you about a gorgeous company I recently discovered. Regular readers will know I adore all things vintage and often can be seen scouring charity shops and flea markets for vintage goodies and individual pieces. I came across GiGi Vintage on Twitter whilst hunting for an Argyle cable knit cardigan. The lovely Gurmeet came to my rescue and informed me that they had one in stock, which was perfect, so I snapped up straight away! This gorgeous cardi arrived in the post for me the other day, and only cost £35.00 which is great for my bank balance, and a lot cheaper than others I have seen on the High Street! I’m really pleased with my purchase, and with my student loan just around the corner, I’ll definitely be buying more again soon! Here are a few of my favourite pieces from GiGi Vintage’s current collection. This gorgeous playsuit is a great transitional piece. Wear it in the sun with wedges and retro sunnies for a relaxed summer look, or team it with opaque tights, lace up boots and a fine knit cardigan to transform it into a winter look. This vintage jumper has such lovely detail and would look great teamed with some skin tight jeans and ankle boots. The camel colour is also right ob trend for Autumn/Winter. This ditsy print dress is so pretty and versatile, and has some gorgeous detailing with a crochet peter pan collar and tulip hemline. This would be perfect teamed with a boyfriend blazer and heels. This just has to be my favourite item from the whole collection at GiGi Vintage. 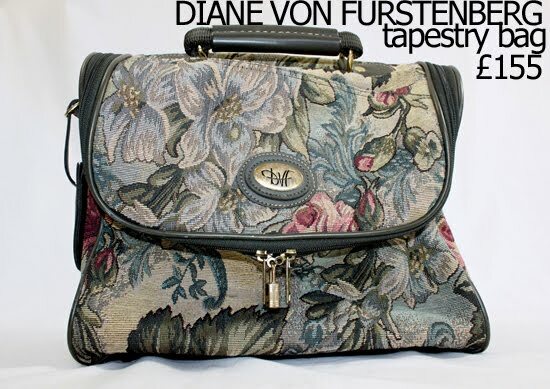 I absolutely adore this Diane Von Furstenberg tapestry shopper. The pattern is beautiful. As you all know, I love tapestry bags and have my own, so this is definitely something I would go for. All in all, GiGi Vintage has some amazing pieces and I would urge you to go and have a look at their stock! I have my eye on a couple of things my self and will be purchasing again very soon! 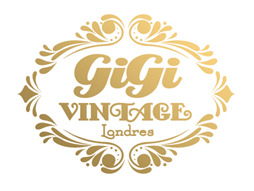 You can also follow GiGi Vintage on Twitter to keep up with regular updates, and you can also ‘like’ their Facebook page also! What are your favourite pieces from the site? 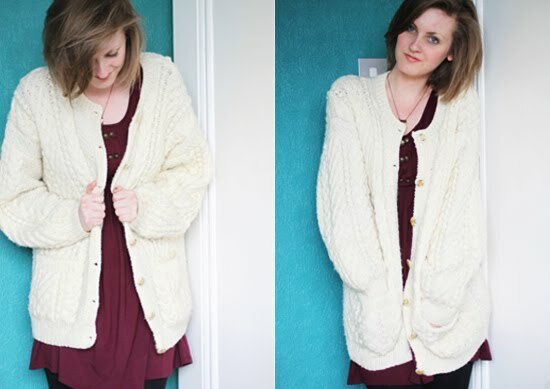 wow that cardigan looooks sooo good and cosy! i just did a post on cable knit jumpers/cardis.